I’ve had a long work week, which ended in frustration this evening in–I’m hungry, but the planned meals just don’t DO it. After staring in the fridge for a while, and going back to take a few of those silly online quizzes, I still hadn’t the foggiest idea what I wanted to eat. More peering into cabinets (sardines–nope, tuna–NOT). While skulking through the pantry, I realized that what I’d most likely cook were I not trying to be really serious about weight loss would be pasta. Obviously, that won’t do–at least not pasta, as we most commonly think of it. On my grocery rounds day before yesterday, I noticed that there was a new section of pasta displayed with lots of signage designed to attract attention–it was gluten-free pasta. I’m not gluten intolerant so I usually don’t pay attention to that (and I get really irritated when I see fruits and vegetables touted as gluten free–but I won’t go there now). 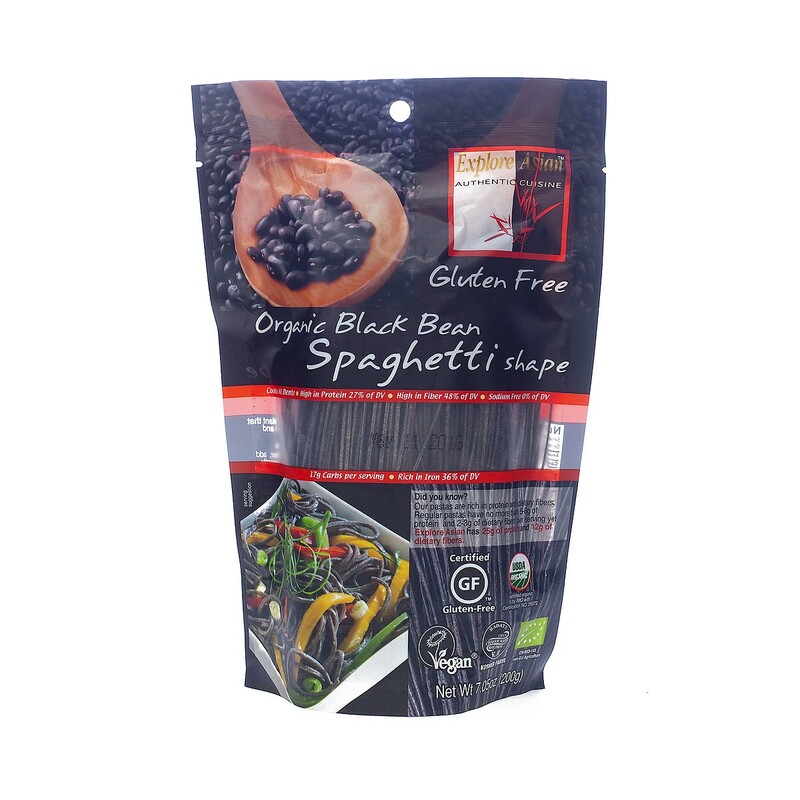 As I stood perusing the boxes, I had a faint memory of a friend telling me that her grandchildren liked black bean pasta, so I read the ingredients list–and it was only black beans. I found that rather amazing, since so many gluten free products have potato starch or other things that are off limits to me right now. I succumbed–I bought a package of black bean pasta. I stashed the black bean pasta (pasta?) in the pantry and went straight to the Merriam-Webster unabridged dictionary to look up pasta. I discovered that it was defined as “an alimentary paste in processed form”. While spaghetti was given in an example nothing was specified as to what the paste was made of. Ok–it’s black bean pasta. I spend a little time thinking about why I eat pasta. It’s because I like pasta. I like the different shapes, too. I like the flavor of pasta made from wheat, but there is a texture factor there as well. Maybe there is more than that–maybe there is something about twirling spaghetti or angel hair pasta around a fork to get it into my mouth–part of the process of eating that’s satisfying–more than just the flavor. The result? A pleasant surprise! It was remarkably satisfying (maybe just because I was hungry); the texture was good though not quite like pasta made from wheat flour. It’s not overwhelmingly “beany” either. It was so satisfying that I had to think that there is more to my liking pasta than just the flavor. Would I rather have had “real” pasta? Yes, but this was good. Black bean pasta is not going to replace the traditional stuff made of durham wheat flour. It certainly beat trying to fake it with spaghetti squash (though I like that too, but it’s definitely NOT pasta–it’s a vegetable so don’t tell me to use it instead of spaghetti). The final call? I’ll cook pasta made from black beans again until I can have the traditional kind that we usually think about. I don’t know why I had this resistance to this as pasta since I like soba and rice noodles. It’s a good stand in for this meal plan. After eating that I find that there is also pasta made of chickpeas (garbanzo beans). I’m sure I’ll find some other uses for it as well, and I’ll explore other “alimentary pastes” to add to the soba and cellophane noodles as well. But I’ll still want that plate of “real” spaghetti aglio e olio! I’ve never seen pasta like this. I would love to try it but perhaps a little daring for my French supermarket! We are seeing lots of “gluten free” products showing up on shelves here. I do realize intolerance can be a serious medical problem, but I think marketing is definitely taking advantage of it here. It was an interesting food experience–and I’ll likely be using more of it in different ways.